a boss. A really racist boss with a gun. Four years ago, this week, I had just broken up with someone. I was drinking heavily and crying almost constantly and sitting on my couch thinking that I was the worst person of all time. (Clearly I am into being super dramatic on a level of Nicolas Cage in Face/Off.) And then Michael Jackson died. And the news coverage was over-the-top and ridiculous. Two things got me through that hard time. The first of these was the BBC Pride and Prejudice, which is just five hours of Colin Firth and some other people. The second was making light of death by writing parody news pieces reporting on the death of still-dead former president Andrew Jackson. This morning I was thinking back on what I was doing four years ago, and it made me smile. So, I decided to put all of the Andrew Jackson breaking news links into one blog post. That way if, like me, you want to go back and relive a super dark period of my life that was cheered somewhat by the death of an old racist, then you can. 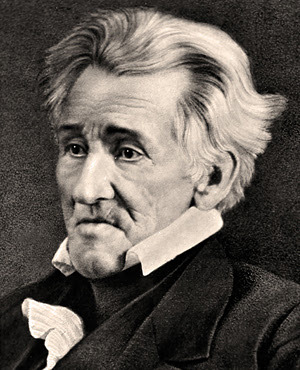 Click here to read about Andrew Jackson being discovered still dead. But then you should click here to read about how some fans paid tribute to the still dead seventh president. When you're done with that, maybe you would like to click here to read about the time Andrew Jackson went to summer camp. Just kidding! It's about him killing more people. Read this to find out about how Andrew Jackson went from a young man to a lifeless corpse in just 78 years! Then, finally, read this one to drink the salty tears of one of Andrew Jackson's children.